Peachtree Publishing Company, 9781561459377, 48pp. At the age of four, Jean-Francois Gravelet walked across his first balance beam. Later, he took to the tightrope like a spider to its web, and with his family troupe, he climbed toward stardom. As The Great Blondin, his feats became more and more marvelous, but he was bored. That is, until he visited Niagara Falls and imagined doing something that no one else had ever accomplished. It would take courage to cross the falls, but Blondin first had to figure out how to get a rope across the rushing water, what kind of rope and knots to use, and how to handle the huge sag in the middle of the walking rope. In 1859, with all of the work completed, Blondin would step out onto the most dangerous tightrope walk he'd ever faced. 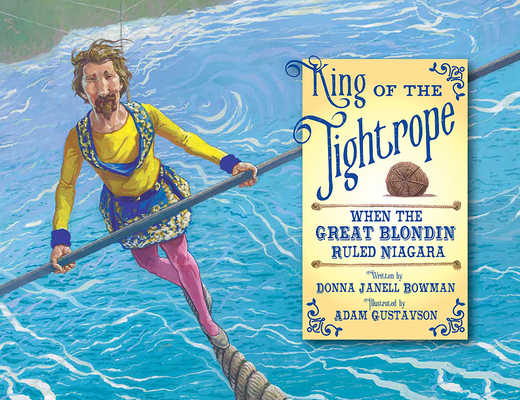 Author Donna Janell Bowman's trademark in-depth research gives readers a clear and exciting look into the accomplishments of The Great Blondin, as well as the hard work, determination, and meticulous mathematic and scientific planning it took to cross Niagara Falls on a tightrope. Adam Gustavson's detailed illustrations turn this book into an experience that will inspire readers of all ages.